1) In this song, Mr. Como maintains it's impossible to ask a baby not to cry. When did you most recently hold a baby? Did you ask him or her not to cry? 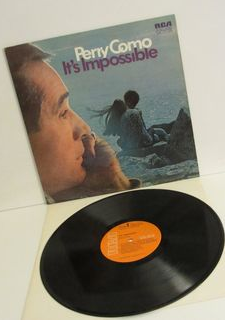 3) Though Perry Como was born in Pennsylvania, he didn't speak English until he began grade school. His parents were Italian immigrants and the family only spoke Italian at home. Do you know any words/phrases in Italian? 4) He met Roselle, the girl he would marry, when they were both still in high school. Tell us about a high school classmate you were crazy about back in the day. 5) When he was just 14, his father's ill health made it essential that Perry begin working after school to help support his family. He apprenticed to a barber but was so short, he had to stand on a box when he cut hair. Again, going back to school, were you taller than your classmates? Shorter? Or were you the average height for a kid your age? 6) While taping his annual holiday special in 1971, he fell from a platform and broke his knee. He had to wear a cast and endure 8 months of rehab. Have you ever broken a bone? 7) During the decades when he was a recording and television star, Perry Como was also an avid golfer. He was so popular that many of the best pro golfers of the day -- Jack Nicklaus, Arnold Palmer, etc. -- were happy to play with him. It's estimated that it takes about 4 hours to play 18 holes of golf. What celebrity would you most like to hang around with for four hours? 8) After he retired, Perry's passion switched from golf to fishing in the waters near Palm Beach, Florida. His catch of the day often ended up as his family's dinner. What's for dinner at your house tonight? 9) Random question -- They say "birds of a feather, flock together." But that's not always true. Can you think of an area where you are out of step with most of your friends/family? 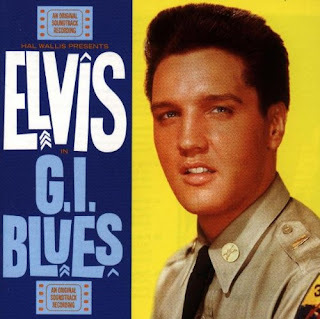 2) In this song, Elvis sings about marching, and complains that the Army doesn't give Purple Hearts for fallen arches. Do you have any aches or pains to report this morning? 3) This song is from the 1960 film of the same name. In the movie, Elvis is in The 32nd Armor Regiment of the United States Army. That's the same regiment he served with in real life. He had the 32nd written into the script as a shout-out to the soldiers he came to know, but realized he'd likely never see again. Is there an old friend you're missing this weekend? 4) Memorial Day kicks off the summer season. What's your favorite picnic food? 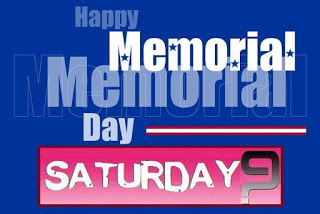 5) Let's celebrate the Memorial Day holiday with ice cream. What's your favorite flavor? Cone or cup? 5) This marks the weekend when Americans step up their outdoor activity and do things they may not have been able to do during the winter months. For example, when is the last time you applied mosquito repellent? 9) Random question: How do you define success? 2) When she was feeling her lowest, she heard a song on the radio that lifted her spirits. What's the last thing you heard on the radio? 3) This song includes the sound of squeaky wheels, indicating a sudden stop and perhaps a near-miss. Tell us about your most recent traffic mishap. 4) "Last Night a DJ Saved My Life!" is featured in the 2002 video game, Grand Theft Auto: Vice City. Do you spend much time on video games? 5) This week's featured artist, Indeep, was a trio. We've had many groups, some duos and tons of solo artists on Saturday 9, but not many trios. Can you name another popular trio? 6) The last time Indeep performed together was in 1997, at a New Year's Eve show in Paris for French TV. Have you celebrated a holiday in another land? 7) Britain's Royal Family is in the news this weekend, with attention centered on the nuptials. The Royals made news in 1982, as well. When this song was popular, Michael Fagan gained momentary fame by breaking into Buckingham Palace. He found The Royal Bedroom, where he came face-to-face with the Queen. He reports that Queen Elizabeth sleeps in a nightie that "reached down to her knees." What did you wear to bed last night? 8) In 1982, you could buy a loaf of white bread for 50¢. Today, the national average price for that loaf of bread is more than $2.50. When you go grocery shopping, do you comparison shop and make purchases at more than one store? Or do you prefer one-stop shopping? 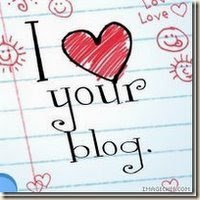 9) Random question: What's the first famous quote that comes to your mind? 1) The title of this song, "Mother and Child Reunion," came from a dish Paul Simon had at a Chinese restaurant. "Mother and Child Reunion" was chicken and egg drop soup. When did you last eat chicken? 3) Mother Winters taught Sam to always dispose of the dry cleaning bag, as storing clothes in the bag may discolor the fabric. Do you have any useful household hints to pass along? 4) Have you put away your winter clothes yet? 6) In the 1600's, the British began celebrating "Mothering Sunday." Children presented flowers to their mothers after Sunday service. When did you last place flowers in a vase? Where they store-bought, or picked from someone's garden? 7) The German word for "mother" is "mutter." What other German words do you know? 8) When Sam was a teen, her mother used to scold her for monopolizing the family landline. With the advent of cell phones, do you think parents and children still clash over telephone etiquette? 9) To celebrate Mother's Day, Sam is giving away her mother's favorite, Hershey Bars!Would you prefer classic milk chocolate, dark chocolate or milk chocolate with almonds? 1) In this song, four friends congregate on Main Street to look longingly at pretty girls. In your town, where is the best place for people watching? 2) This song was written for the Broadway musical, The Most Happy Fella. Who is the happiest person you know? 3) The members of The Four Lads met at Toronto's St. Michael's Choir School. Growing up, did you attend parochial or public school? 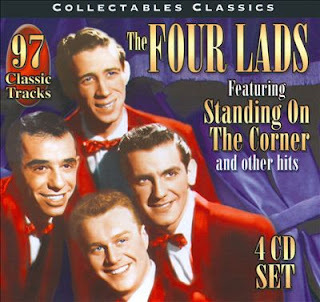 4) The Four Lads always wore jackets and ties when they performed. Do you enjoying dressing up? Or would you rather keep it casual? 5) While this song was a hit for The Four Lads, they were completely overshadowed in 1956 by Elvis Presley and "Heartbreak Hotel." Who do you think dominates today's music scene? 6) The Wizard of Oz aired on TV for the first time in 1956. Sam was never crazy about those flying monkeys. Tell us about something that frightened you when you were a kid. 7) What scares you now? 8) Since this week's song is about pretty girls: 1956's Miss America was Sharon Ritchie of Colorado. Today Colorado has the distinction of being the home of more microbreweries than any other state in the union. Which are you most particular about -- your beer, your wine, or your coffee? 9) Random question: We all have small, irritating habits, like soup slurping or not replacing the cap on the toothpaste. What's your nasty little habit?